Home / Blog / Why do dogs scratch the ground after they wee? 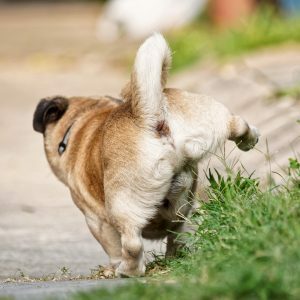 As a dog owner, you are very likely familiar with the amusing display of your dog flinging dirt and grass around after a wee. It’s called ground scratching. Firstly, not all dogs exhibit this behaviour and those that do will be location-selective. And it isn’t limited to dogs; wolves and other mammals do it too. Generally, ground scratching is preceded by the careful selection of toileting real-estate and the deposition of a wee/poo/both. Wee or poop your dog has just deposited (visual and smelly signal). Essentially you either see me doing the scratching behaviour or smell me later. The meaning of the message is something like “just letting you know that I am around” and/or “if your my buddy, and we are on good terms, then its ok for you to be around here but if not you may want to head off to another park, cheers”. No! this is a normal dog behaviour. Let your dog be a dog. They have a message to send, interrupting them will leave your dog frustrated. So stand back to avoid a faceful of dirt.